Sky Zone has just completed construction on ten new attractions at the trampoline park here in Shawnee! 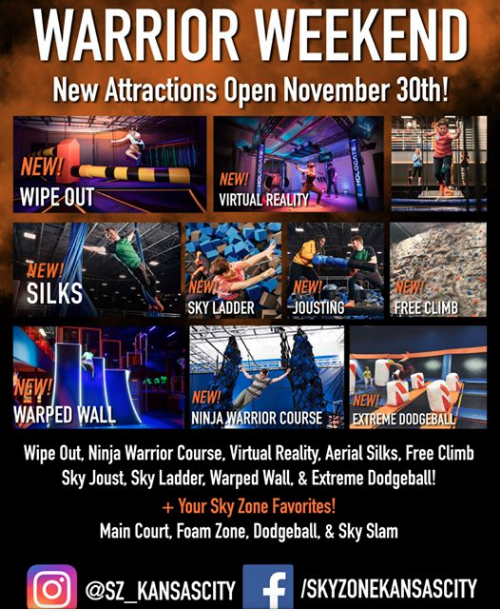 The renovations include a new, state-of-the-art Ninja Warrior Course, Free Climb Rock Wall, Virtual Reality Zone, Aerial Silks, Warped Wall, Wipe Out, Battle Beam, Sky Ladder, Parkour Blox, Ultimate Dodgeball and more and will celebrate with their Warrior Weekend event starting Thursday! The Rock Wall, Warped Wall, Sky Ladder and Ultimate Dodgeball were totally renovated, while the rest are all new! In the brand new VR Zone, guests can put on a headset and become their very own video game character, immersing themselves in a 360-degree video game. The Battle Beam allows guests to verse one-on-one, in a jousting battle testing their balance and strength. The Challenge Zone puts one's coordination to the test in a series of fun obstacles and the Ninja Warrior Course lets guests challenge their friends in a test of strength, speed, and agility. Brand new silks can bring out your inner aerial silk artist by climbing, swinging and spinning in midair fun! Parkour Blox is a fun way to test your skills by jumping over obstacles in the Freestyle Court, like various foam vault blocks. At the Wipe Out course, guests can spend endless amounts of fun jumping their way to victory as a giant, spinning, foam sweeper arm comes along. To celebrate, there will be a Warrior Weekend hosted by Alex Carson, who has competed on American Ninja Warrior for four years and is a two times national finalist, and Donovan Metoyer, a five-season veteran of the show who currently teaches kids about the importance of fitness and strength. Carson will be there on Dec. 1 from 11 a.m. to 2 p.m.; he will be performing the new Ninja Course and Challenge Zone, signing autographs and giving ninja training tips to kids. Metoyer will be there on Dec. 2 from 11 a.m. to 2 p.m.; he will also run the course, sign autographs, give ninja training and fitness tips to kids. Instead of the usual Glow Nights, there will also be Ninja Warrior Glow Nights on Friday and Saturday nights from 7 p.m. to 12 a.m. where the lights will go off and it will be for glow in the dark Ninja fun at Sky Zone. All of Warrior Weekend, from Friday to Sunday, will feature giveaways, games, and appearances from the Ninjas. Sky Zone is also giving away over $20,000 in prizes. Guests visit Sky Zone over the course of the weekend have a chance to enter to win them. Be sure to check out Sky Zone for more information about the updated and newly built attractions. Get ahead of the game and fill out a waiver in advance so you can get to having fun at Sky Zone Kansas City sooner! This will be an event that you don't want to miss! Stay in the know on all events in Kansas City, connect with 816area today. Best of all, it's free!